1. Combine and grind the coconut, green chillies and 1/4 cup of water to a smooth paste. 4. Add the dry red chillies and curry leaves. 5. Add the onions and saute until they turn light golden. 6. Add ginger garlic paste and stir well to mix. 7. Cook for 2 minutes and add the red chilli powder, turmeric powder and salt. 8. 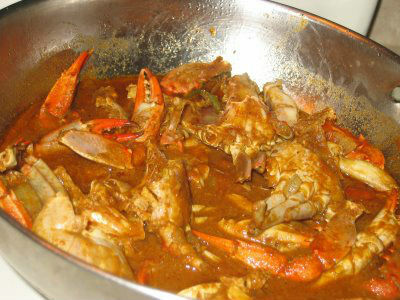 Add the chopped tomato and crab. 9. Cook till oil starts to separate. 10. Add the ground coconut paste and 1 cup of water. 11. Cover the pan with a lid and reduce flame to low. 12. Simmer for 15 minutes. 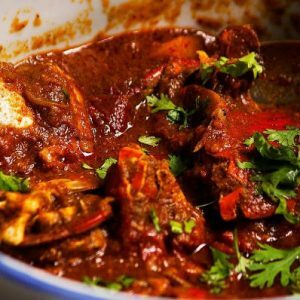 Feel free to comment or share your thoughts on this Malabar Crab Curry Recipe from Awesome Cuisine.